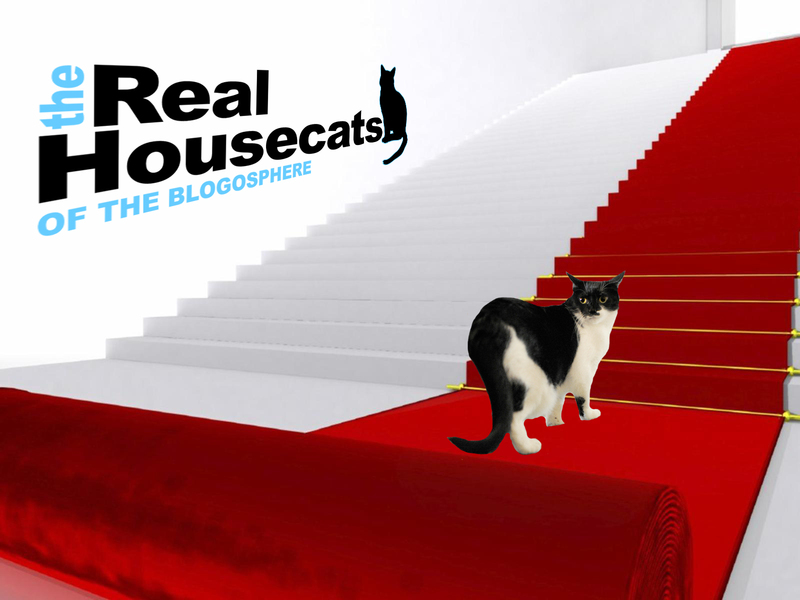 We're almost ready for the highly anticipated premiere of The Real Housecats Of The Blogosphere. I've been inspecting the red carpet. You can never be too sure. 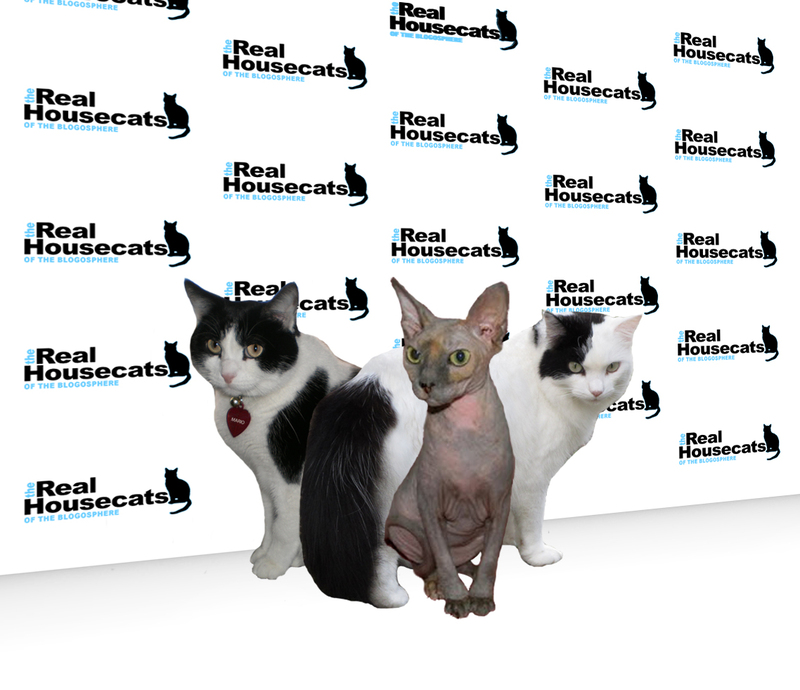 We've finally given access to the pawparazzi and are pleased to offer you an EXCLUSIVE first glimpse at the Housecats' official publicity photos. 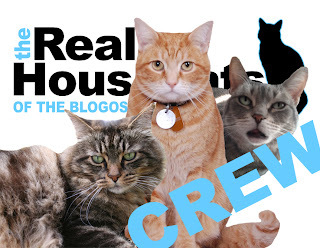 As expected, drama is no stranger to the Housecat scene. This is the first time the three stars have appeared together in public. CK looks to be starstruck next to her longtime celebrity idol, Katie. Wally is just waiting for the food. 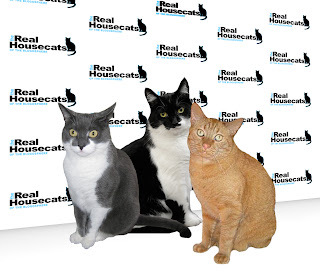 these Real Housecats are trying to bridge the gap to peace. But Figaro may be packing heat and Kjelle won't show his eyes. has invited Artemesia into his private tunnel. Kite is disgusted by Artemesia's blatant tail-flaunting. Three of the official crew members were on hand to manage the frenzy. They had their paws full. Check out the new Real Housecats tab at the top of the page to read more about the crew! Don't stray too far from your computers, phones and iPads. The premiere will be launching sometime within the next 48 hours. 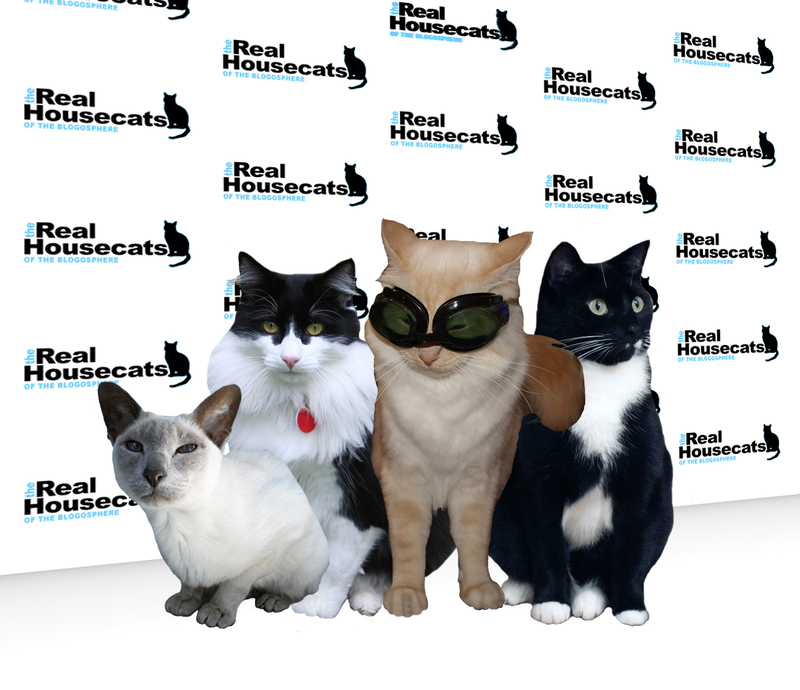 If you missed the official trailer, or if you just can't get enough of the Housecats, click HERE to watch on YouTube. Starstruck?? Are you crazy Katie?? MOL I look like I'm looking for trouble or I can just be looking out for the POlice. I didn't do it but I'm ready to run anyway if I see the man. Na mean? How cool to get a clue as to the story lines. Hope my fans can wait another 48 hours to see my premiere. I'm going out on the town now if you want to hang with me. omc...OMC!!!! That's Miss Kathy Keisha!!!!!! And Mario!! And Penelope!!! Ginger as a gossip columnist!!! That tabby tattletailer will dish it like nokitties business!!! Watch your back Katie...don't tell him any of your secrets. This is really exciting...we can't wait for the premiere! Our Mommy is totally caught up in this!!! Wow! We can't wait to see what happens. Katie, we are quite certain that the premiere will WOW us all. Cannot wait! 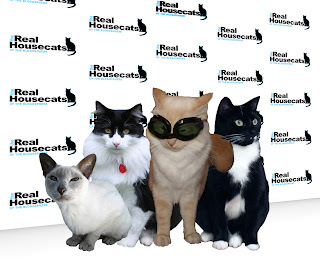 Kjelle Bus looks like a superstar in his shades, and Ginger is perfect as the gossip columnist. Can´t wait to the premier ! Man, I am so excited for the big premier! But even more so, I can't wait for the after-parties! I just know there will be some good food there! I'm sooooooo looking forward to this show. It's gonna be GREAT! I'm in charge of Craft Services?? I think that means I get to play alot! Oh, I'm good at that!! Ah, Craft Services means FOOD. We're all counting on you! Keep the salmon coming. Well, if it was KRAFT Services, then I woulda figured it out! ;) Oh, I'm good with the food...you just hafta watch me to make sure I don't eat it all myself! 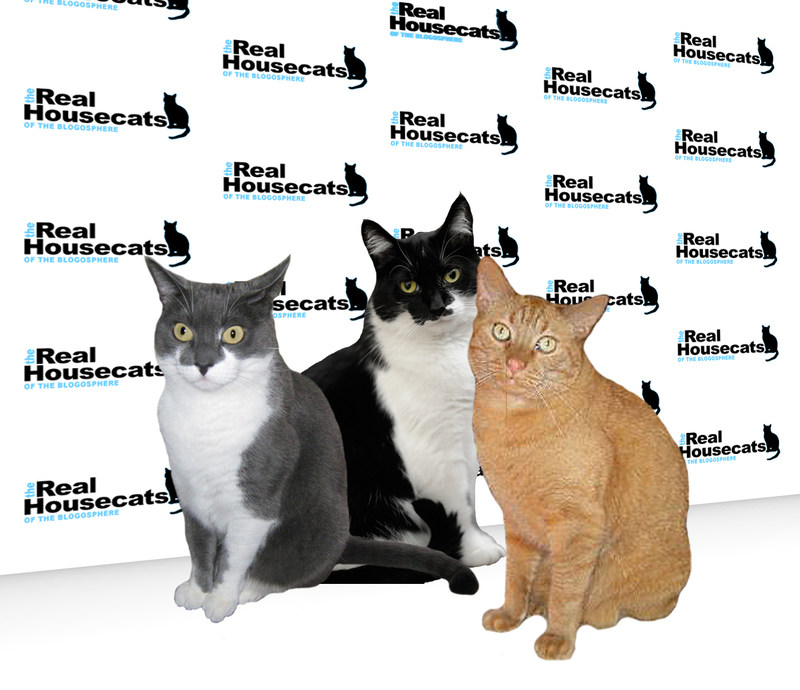 3 such handsome Man Cats! Me hopes they falls for my big blue eyes and my tiny self. Me is just so excited, me is happy dancing! Gotta run and take care of my Public Relations duties...I have Ellen Degeneres on the phone as we speak! Looks like I've missed some fun! 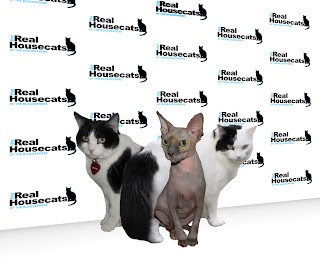 I can't wait to see more of The Real Housecats!